As one of the world's leading experts on the safe operation of cranes, Isom Crane & Rigging Safety Specialists founder Dennis Isom can bring a wealth of knowledge to your job site. Whether you project is in the planning stages or is already in progress, you should contact Isom Crane today, to ensure that your crane operation is being executed in a safe and legal manner. 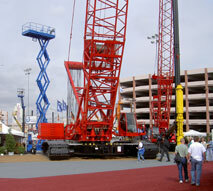 Isom Crane offers a variety of consulting services. Call today and put Isom Crane's 36 years of experience to work for you.